Saints quarterback Drew Brees addressed a controversial non-call that cost his team a trip to the Super Bowl for the first time Friday on "Good Morning America." "It seemed like it was about as obvious a call as there is to be made," Brees said. "But -- you have to worry about the things you can control and not the things that you can't and certainly that's something that we can't control." 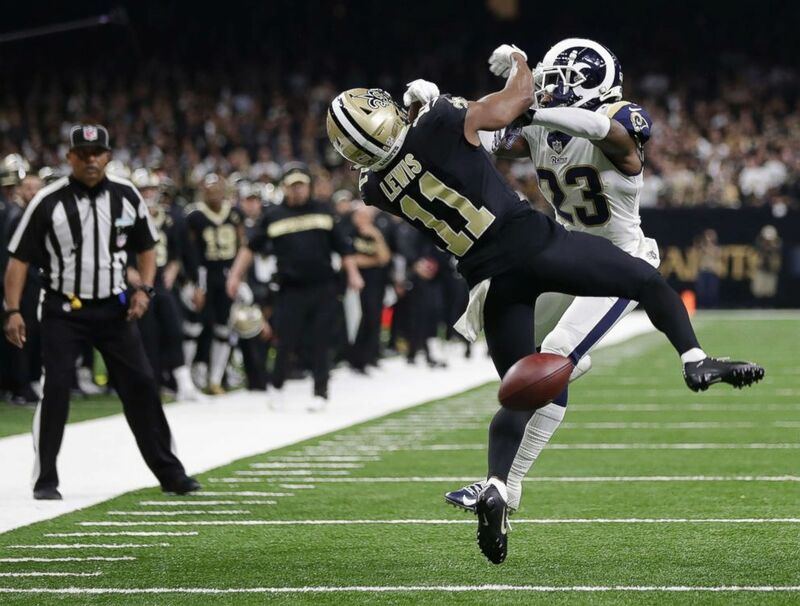 With 1:45 left to play in the fourth quarter of the NFC Championship game on Jan. 20, Los Angeles Rams cornerback Nickell Robey-Coleman made contact with Saints wide receiver Tommylee Lewis, but referees didn't call pass interference. That decision cost New Orleans a spot in Super Bowl 53 and has since drawn criticism and resulted in both lawsuits and fines. New Orleans Saints wide receiver Tommylee Lewis works for a catch against Los Angeles Rams defensive back Nickell Robey-Coleman during the second half the NFL football NFC championship game, in New Orleans, Jan. 20, 2019. Brees said the Saints "unfortunately" missed out on other opportunities. "There were opportunities before that play, there were opportunities after that play for us to go and win that game and, unfortunately, we weren't able to do that," he added. Following the team's devastating 26-23 overtime loss, Brees remained quiet about the play itself but shared a message with Saints fans on Instagram. "I've spent this last week navigating the heartache and disappointment from the game," he wrote. "Some things within our control and some outside our control that caused us to fall short." For his part, Saints head coach Sean Payton immediately addressed the play in a post-game press conference. "That call makes it first and 10, we're on our knee three plays, and it's a game-changing call," Payton said. And NFL commissioner Roger Goodell weighed in on the non-call earlier this week. "It's a play that should be called," Goodell admitted for the first time on Wednesday. Brees said he wished that Goodell's response had come immediately after the game. "I think we all wish that he would have addressed that right after," Brees added. "At the end of the day, that's something that is out of our control as players and coaches." 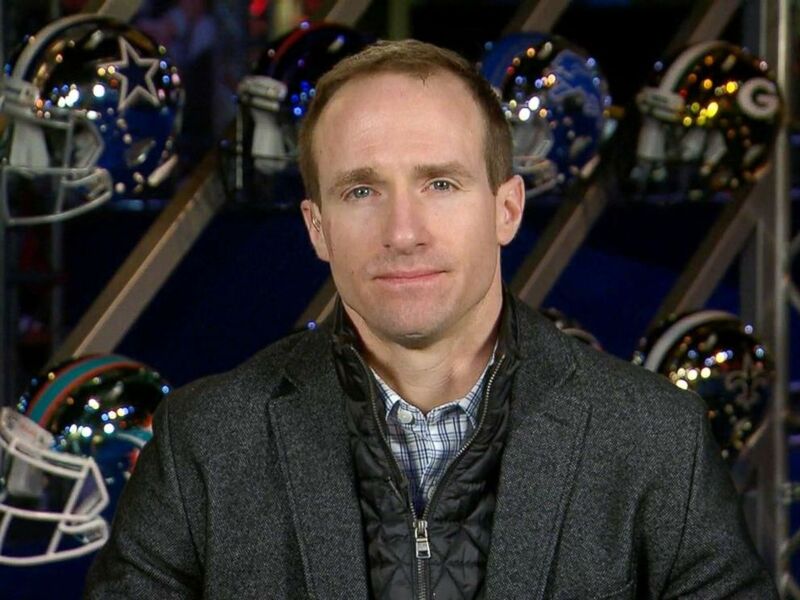 PHOTO:New Orleans Saints QB Drew Brees talks to "Good Morning America," Feb 1, 2019, for the first time since the NFC Championship game loss. "He hasn't reached out to me," Brees said, adding that none of his teammates have heard directly from Gooddell. Robey-Coleman has since been fined $26,739, ESPN reported. Despite clinching a birth to the championship game, Brees, 40, had a record-breaking season eclipsing Peyton Manning as the NFL's all-time passing leader. The 2010 Super Bowl winning QB offered simple advice to the Rams' young quarterback, Jared Goff, who's making his first Super Bowl appearance. "This," Brees said, "is what you've worked so hard to do -- go out relax and play ball." ABC News' Stephanie Wash contributed to this report.